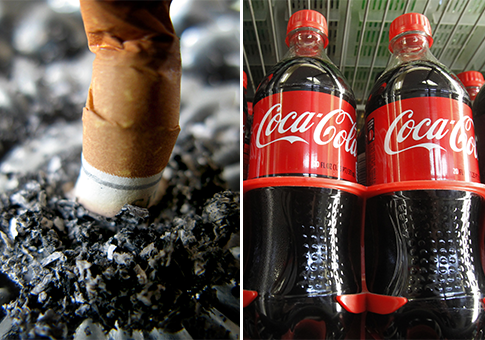 At least seven local health departments illegally used stimulus grant funds to lobby for greater taxes and restrictions on tobacco and unhealthy foods, according to a report released Tuesday by a nonprofit watchdog group. The stimulus-funded Communities Putting Prevention to Work (CPPW) program disbursed about $373 million intended to educate the public about tobacco use and obesity. Federal law prohibits grantees from using the funds for lobbying activities. According to the group Cause of Action, local health departments from Alabama to California used the funds to devise or promote legislation designed to curb tobacco use or combat obesity. The report detailing the allegations is the product of a 19-month investigation into the CPPW program. "[Cause of Action’s] investigation revealed that CPPW money went to support lobbyists and public relations companies who used taxpayer dollars to push laws and agendas that would lead to tax increases on tobacco and high calorie products," the report said. The report said illicit uses of CPPW grant funds "essentially transform[ed] the CPPW program into a conduit for lobbying for higher taxes and bans on otherwise legal consumer products." Federal law prohibits grant recipients from using federal grant funds to influence "an official of any government, to favor, adopt, or oppose, by vote or otherwise, any legislation, law, ratification, policy, or appropriation." Internal guidance from the Centers for Disease Control and Prevention (CDC), which administers the CPPW program, clarifies that the law applies "specifically to lobbying related to any proposed, pending, or future federal, state, or local tax increase, or any proposed, pending, or future requirement or restriction on any legal consumer product." Cause of Action executive director Dan Epstein criticized the CDC for faulty oversight in an interview with the Washington Free Beacon. He also said specific CPPW grantees may have "committed not just violations [of lobbying prohibitions], but fraud." According to internal communications from South Carolina’s Department of Health and Environmental Control (DHEC) obtained by Cause of Action through public records requests, DHEC officials altered meeting minutes in order to hide the involvement of officials involved in grant fund disbursements after CDC expressed concerns about the use of grant funds for lobbying activities. "The DHEC stated outright that the purpose of altering the minutes was to hide the fact that its CPPW program coordinator had directed illegal lobbying in the pursuit of smoke-free ordinances," according to the Cause of Action report. The DHEC did not return a request for comment. DHEC grant activities, like those of other state health agencies examined in the report, were explicitly geared toward specific legislative goals. Its application for CPPW funding said it would use taxpayer funds to "increase the support for and adoption of comprehensive smoke-free laws." While that proposal and similar ones from other states appeared to violate laws governing the use of federal grant funds, Epstein says the CDC has made no effort to effectively oversee the CPPW program. "It’s not just a sign of misuse of taxpayer dollars," Epstein said. "In fact, there’s some indication that the CDC encouraged this to occur." Previous investigations of the CPPW program have produced similar findings. According to the inspector general for the Department of Health and Human Services (HHS), CDC’s parent agency, federal guidelines for CPPW grant recipients "appear to authorize, or even encourage, grantees to use funds for impermissible lobbying." Members of the House Committee on Energy and Commerce cited that report and apparent violations of the lobbying prohibitions in multiple communications with HHS Secretary Kathleen Sebelius regarding the CPPW program. The committee’s investigative panel examined the program during a 2012 hearing. Annual CPPW disbursements are scheduled to grow to about $2 billion in 2015. When expenditures increase six-fold, Epstein said "we’re in a serious situation, because we’re going to undoubtedly see six times the fraud." Florida's Miami-Dade County Health Department, one of the agencies singled out in Cause of Action's report, denied any wrongdoing in a statement emailed to the Washington Free Beacon. The Department "did not utilize any of the CPPW funding for lobbying activities, nor does the Department have any reason to believe that any of its contracted providers did so either," said spokeswoman Olga Connor. "The Department of Health's contracts specifically bar any provider from utilizing the CPPW funds for any type of lobbying activities." The CDC did not return request for comment. Miami-Dade County was the only local government highlighted by Cause of Action to return a request for comment. This entry was posted in National Security and tagged Cause of Action, Congress, Federal Bureaucracy, HHS, Kathleen Sebelius, Media, Tobacco. Bookmark the permalink.